Neutrinos From That Recent Gamma-Ray Burst? The very recent report of a powerful and long-lived gamma-ray burst (GRB), and questions and remarks by my readers (thank you! ), have motivated me, both as a scientist and a blogger, to try to understand whether we should have observed neutrinos from this GRB. This is forcing me to catch up on the related subjects of GRB’s, searches for high-energy neutrinos, and the highest-energy cosmic rays. I’m certainly not caught up yet; there are decades of research out there, and I’m quite far behind on developments over the past three or four years. But here are some of the basics that I believe I understand. Still, be cautious with the content of this post, both because I’m not an expert and because this is a very active area of research in which some fraction of the more speculative stuff will surely turn out to be wrong. I will try to refine this post with a more detailed and corrected article sometime later, perhaps once we know whether neutrinos from this GRB were or were not observed. GRBs that last more than a few seconds are widely believed to be associated with an exceptional form of Type II (or “core-collapse”) supernova, though this is not known for certain. In these types of GRBs, there are (at least) two sources of photons (everything from gamma-rays to visible light to radio waves) and two sources of neutrinos. It is important not to confuse the different sources! Fig. 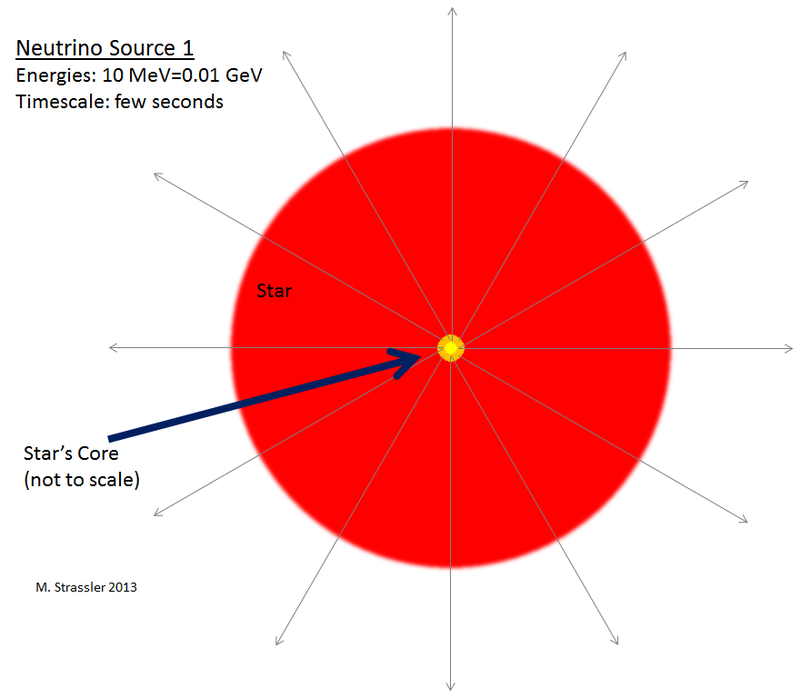 1: From the imploding core of the star, neutrinos with energies somewhat below 1 GeV pour out in all directions. i.e. 1057 or more. Yeah, these are big numbers. (Actually the numbers are even bigger because additional neutrinos and anti-neutrinos can be made by other processes in the explosion.) These neutrinos carry off the vast majority of the energy of the supernova! Photons emitted in a supernova carries only a small fraction of the energy released. But these neutrinos are emitted in all directions (Figure 1), so only a tiny, tiny fraction arrive at Earth. And the farther away is the supernova, the smaller this fraction becomes, falling like the square of the distance to the supernova. Moreover, because these neutrinos are of only moderate energy (relative to the second neutrino source mentioned below), their interactions with matter are very rare. So only a tiny, tiny fraction of these neutrinos interact with anything in the Earth. And only a tiny, tiny fraction of those go inside the detectors that scientists have built to detect neutrinos of these energies. Consequently, neutrinos from Source 1 can only be detected if the supernova that makes them is inside our galaxy (the Milky Way) or in one of its satellites, such as the Large Magellanic Cloud (LMC). In fact the first (and so far only) confirmed detection of neutrinos from a supernova occurred in 1987, when Supernova 1987a exploded in the LMC. Only about 10 neutrinos were observed. Today detectors are larger and better, but still the numbers wouldn’t be much larger. The LMC is about 170,000 light years away. 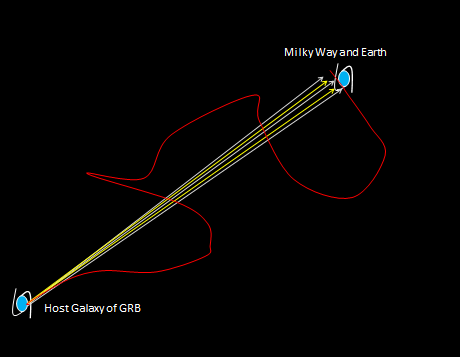 The big GRB observed very recently was about 3.6 billion (3,600,000,000) light years away. So there’s no chance we’d observe neutrinos from Source 1; the supernova is much, much too distant. Photon Source 1 (quite well understood): These photons provide the visible-light sign of a supernova. It’s by this light that historically most supernovas have been discovered, typically a week or two after the explosion. The main explosion mentioned above occurs within the dense environment of the star. It’s so dense that even the neutrinos can’t escape it for a full second. 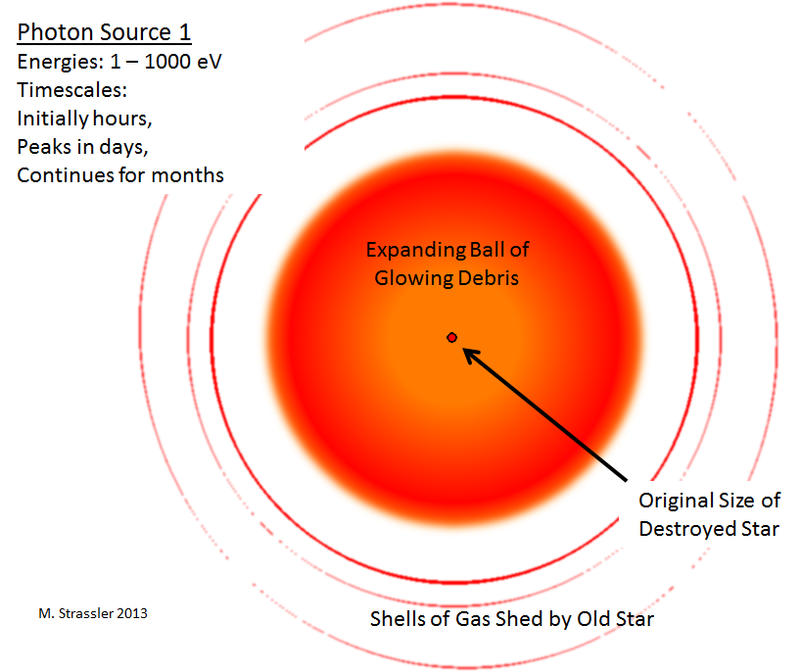 It takes much longer for the explosion’s debris, and its glow in visible light and in somewhat higher-energy photons, to start emerging from the exploding star and the shells of gas that the star emitted in its old age (Figure 2). Supernova 1987a didn’t start to glow in visible light for about two hours after the neutrinos emerged. As the hot debris from the explosion moves outward, making a growing ball of heated gas around the exploded star, such supernovas become brighter and brighter for two or three weeks. Most supernovas are discovered only as they approach peak brightness; only a few have been observed very soon after they began. Fig. 2: The expanding debris from the supernova becomes a ball that shines brightly in photons with energies far below 1 GeV, including photons of visible light. Most of the resulting photons have energies far below the energies of the Source 1 neutrinos; instead of energies in the 1 MeV = 0.001 GeV = 1,000,000 eV range, they have energies in the 1 – 1,000 eV range. [Visible-light photons have energy of a few eV; photons from a decaying Higgs particle have energy of about 60 GeV.] For a supernova as far away as the one that produced the recent gamma-ray burst [GRB], the supernova won’t be bright enough to see in even a powerful telescope for a week or two after it occurs. We are expecting it to be seen soon, if our understanding of GRBs is correct and the recent GRB really came from a supernova. Now those photons and neutrinos are made in every Type II supernova. By contrast, the next two sources are (presumably) special to GRBs. Photon Source 2 (very poorly understood): These photons are ones that give the GRB its name; they have a wide range of energies, but are often observed up to many GeV. That’s much more energetic than the Source 1 neutrinos and vastly more energetic than the Source 1 photons. It is widely believed that only rare Type II supernovas make these photons. Also, it is widely believed the photons are produced within directed beams consisting of a variety of high-energy particles, called “jets” (Figure 3). (These astronomical jets are not to be confused with what Large Hadron Collider physicists call “jets”.) These GRB photons can only be observed when the jets happen to point more or less at the Earth, which makes it even more rare for us to see them. Fig. 3: The most common speculation concerning the GRB’s high-energy photons (with energies extending up to and beyond 1 GeV) is that within jets, high-energy charged particles are produced, and some of those particles have collisions with other material, creating high-energy photons moving in the jet direction. A similar phenomenon produces neutrinos, again with energies far above 1 GeV. The number and energy of these neutrinos depends in some detail on very poorly understood aspects of the jets and of the material they pass through. Jets of material are quite common in astrophysical contexts, occurring in everything from supernovas to giant black holes in the centers of galaxies. They are very poorly understood, however. And I understand them even less well. So I’m just going to report that yes, such things do occur, and are probably due to very complicated effects of electric and magnetic fields outside of rapidly spinning objects. In any case, what supposedly is happening is that shock waves in the explosion, and powerful electric and magnetic fields within the jets, are serving as a natural particle accelerator. Charged particles in the jets (electrons, protons, and atomic nuclei) are accelerated to very high energy, perhaps even to energies billions of times larger than what the Large Hadron Collider can do. In collisions of the high-energy electrons with lower-energy photons that are present around the exploding star, energy can be transferred from the electrons to the photons. There might be other sources for the photons too. So along with the high-energy electrons come some high-energy photons. Since photons are not bent by magnetic fields, these gamma-rays, unlike their parent electrons, travel straight from the supernova to Earth, without delay and without changing direction (Figure 4). So even though we can’t observe the electrons that are accelerated, the photons produced by them go straight across the universe, and a few of them arrive at Earth, if the jet is favorably pointed. The jets are apparently only present for a relatively short time (minutes? hours?) after the explosion, and so the same is true of these photons; they are observed only for minutes or a few hours, and their average energy decreases over time. The GRB observed recently had a record duration (many hours), as well as having a single photon which is the highest one observed so far (nearly 100 GeV). Lots and lots and lots of lower energy photons are generated as well, including visible-light photons (around 1 eV = 0.000,000,001 GeV) and even radio waves (another billion times smaller in energy). The recent GRB’s photons were observed in visible-light telescopes and in radio telescopes. The diversity and length of these observations will probably allow us to learn a great deal about this particular GRB, and about GRBs in general. Neutrino Source 2 (but note these neutrinos haven’t been observed, so this is very speculative at this point): Not only photons but also neutrinos and anti-neutrinos will be generated in these jets. But can they be observed? We have to know “How many?” and “How energetic?” before we can say whether the neutrinos that were produced in the recent GRB, or in any GRB, can be detected with modern technology. Fig. 4: The neutrinos (grey) and photons (yellow) from a GRB’s jet travel in essentially straight lines from the GRB, while a proton (red line) will wander in the presence of magnetic fields. (The galaxies are drawn far too large, compared to the distance between them.) The photons and neutrinos can be observed only if the jet points at Earth, and arrive from the direction of the GRB without delay; any protons that arrive do so with a long delay and from a random direction. Just like the GRB’s photons, these neutrinos are produced at the time of, or soon after, the explosion, travel straight across the universe without much delay, and may have much higher energy than the neutrinos produced in Source 1 [making each neutrino easier to detect]. Unlike the Source 1 neutrinos and the Source 1 photons, but like the Source 2 photons, they can only be observed when a jet of material happens to be aimed at the Earth. Or so goes the general speculation. See Figure 4. Meanwhile the high-energy protons that produced those neutrinos aren’t so easy to observe, because they are bent by magnetic fields and take a circuitous route (Figure 4). As a result they are much delayed in time and arrive at Earth (if they do) from a random direction; we observe them but can’t be sure where they came from. As I mentioned, they may include the highest-energy cosmic rays that we have ever detected. Again, Source 2 of the neutrinos is still highly speculative in its details. In some versions of this basic speculation, it has been predicted that these neutrinos are common enough and energetic enough that we should see them in detectors such as IceCube. IceCube consists of a large number of photon detectors that have been embedded into a huge volume (roughly a cubic kilometer) of ice at the south pole. The idea of IceCube (leaving out a number of important details for now) is to detect the rare high-energy neutrino that happens to hit an atomic nucleus and is converted into a high-energy muon; the muon then, in turn, emits Cerenkov light that can traverse the ice and be observed by the photon detectors. IceCube can tell you when the neutrinos arrived and more or less what direction they came from. Since GRBs occur only a couple of times a day, and we measure where each one is on the sky, IceCube can say pretty reliably if a given neutrino is likely to have come from a particular GRB. According to IceCube’s most recent results, just released a couple of weeks ago (thanks to reader Dan for pointing this out), IceCube has seen no such neutrinos, implying the number of such neutrinos is at least a factor of four smaller than predicted by the most common speculations for neutrino Source 2. This may mean that something significant about these speculations needs to be revised… though to my eye, these speculations seem complicated enough that the revisions required might just be in the details, rather than in the overall basic idea. Note, however, that the number of observable neutrinos that the speculations predict is small. IceCube had to look for neutrinos from several hundred GRBs before it could say firmly that it’s not seeing as many as predicted. That means the typical GRB wouldn’t produce an observable neutrino on average; few would produce more than one or two neutrinos in IceCube, even if the current theories about GRBs and neutrinos were correct. The exciting thing about the most recent GRB, to my admittedly naive eye, is that it was so bright and so close and so long-lived that the number of neutrinos expected at IceCube is probably significantly larger than for any previous GRB. I say “probably” because I myself haven’t done a calculation, so I’m just making an educated guess; and I’m not sure any calculation would be very reliable anyway. [If anyone sees a calculation published somewhere, please alert me!] But because this most recent GRB is several times closer than the average GRB, the number of photons and neutrinos that will pass through a detector is several-squared times larger than the average GRB. [Would an expert help me get these numbers right, please?] Also, although the redshift from the expansion of the universe reduces the energies of photons and neutrinos in the average GRB by a factor of two or so, making them a lot harder to detect, that effect doesn’t much apply to this one, for which the redshift is only 20%. Finally, since it produced remarkably high-energy photons, this GRB may have been unusually energetic overall. So this new GRB perhaps represents an exceptionally favorable case for having produced detectable neutrinos, even if the standard speculative ideas are all wrong about how the neutrinos are produced, how many there are, and how energetic they are! So I do think we should be looking forward to news from IceCube… as well as more details from the various satellites and telescopes that already observed this GRB. And I’m sure theorists are busily calculating what IceCube might expect to observe, and what we might learn if it does observe it, or if it doesn’t. Ok, that’s my best effort so far — though I remind you one last time that I’m not an expert, and am still learning things. If any experts read this, please help me fix my mistakes and misconceptions! This entry was posted in Astronomy, Particle Physics and tagged neutrinos, photons, supernova. Bookmark the permalink. Regarding the description of Cerenkov radiation as a “photonic boom” as an analog to the sonic boom that happens with supersonic objects is that the sonic boom is the result of a shock wave travelling at the speed of sound through a medium like air (sound requires a medium as support for the waves to travel). Just to avoid the misconception of the existence of a medium (“ether”) as support for the photonic boom (photons travel through space-time), it would make sense to point out the limits of the scope of the analogy. Light inside a material is not merely traveling through the vacuum of space-time. The light is interacting with the material as it goes thorough it; that’s why it is slower. In this sense, the material provides a local form of ether, and the effect of Cerenkov radiation is rather similar to the case of a shock wave in sound. Your point that light can propagate without ether in the absence of any local material doesn’t much affect the analogy. The human brain (like ice cube) is also, can provide the local form of ether and consciousness as a detector in the effect of Cerenkov radiation. ? ALL matter composed of atoms produces this effect. The human brain is nothing special in this and indeed having Chenekov radiation in it would b quite harmful as in order to be produced high energy radiation would have to smack into a small part of it. Interesting many astronauts report seeing occasional bright flashes, even when their eyes are closed, believed to be cosmic rays colliding with the fluid in their eyes. Thanks for the interesting article. One question – why would the neutrinos form a beam – even if formed from a beam of particles? I thought in general photons and neutrinos were emitted essentially randomly in any direction when they formed? If I fire a beam of bullets at a wall, all the splinters from the wall also form a (rough) beam. Essentially, it’s momentum conservation. It is not true that photons and neutrinos are emitted randomly when formed. It’s often true from the point of view of an observer who isn’t moving with respect to the collision or decay process in which the photon or neutrino was created. But from the point of view of a second observer, who happens to see the colliding objects or decaying object flying by with great speed, the distribution that was random for the first observer will be instead, for the second observer, be highly peaked in the direction of the moving objects. So if I have a beam of protons or electrons or anything else that collides with a stationary target, or if I have a beam of muons or pions that decay while in flight, then the particles produced in the collisions or decays will all form beams, somewhat more ragged than the first one but nevertheless narrow enough to be called a beam. When considering the physics of any kind of collision or impact of an incoming system of objects that produces an outgoing system of objects as output of the collision, the conservation of momentum is an important principle that has to be used to solve the equations that can explain how the systems of objects will behave before and after the impact. This is true to understand the formation of a beam of particles, as well as to understand how to handle an asteroid or a comet that could pose some risk to impact the earth in the future. For this second problem, the analysis of conservation of momentum indicates that deflecting the asteroid or comet (when done with enough time in advance) is a much better choice than shooting or exploding the asteroid or comet. Thanks. For some reason I wondered why, with all the weak bosons flooding a core collapse , all you get is 20 mev neutrinos from 1987a – I’ve got misconceptions. So you’ve got me reading Giunti-Kim. That is the scope of the analogy (and the difference of the analogy): the speed of light in that transparent medium is low enough for still allowing “a speed gap” large enough for other particles that can travel faster than that speed of light within the medium and below the speed limit of the speed of light in the vacuum. The speed of sound is so far below the speed of light limit that there is no “speed gap” consideration, because that “speed gap” is so enormous that in practice it does not impose any limits for macroscopic objects. When considering particles travelling through a transparent medium like water (heavy water in the pool of a nuclear reactor, or even the atmosphere are such cases where we can easily see this blue light), the speed gap must be considered, for there is in practice a limit to the types of particles that can produce this effect. This was the reason of my comment regarding the differences in the analogy. One thing where the analogy stands is the cone of light of the photonic boom and the cone of sound of the sonic boom: the angle of the tip of both cones are due to another aspect of the analogy that stands. There is a GCN circular submitted by IceCube to http://gcn.gsfc.nasa.gov/ (http://gcn.gsfc.nasa.gov/gcn3/14520.gcn3) reporting a non-observation of neutrinos in several searches for spatial and temporal coincidence with this bright GRB. Thanks! If I read it correctly, the possibility of a neutrino in the 100 GeV – 1 TeV range is still not excluded, presumably because of larger backgrounds, but clearly there’s nothing striking there. for the results of the investigation by the IceCube collaboration. Nice post. I love reading about this stuff. Would the neutrino and photon flux still fall with square of the distance when you have a focused beam like a GRB jet? Yes (see Figure 4 for intuition). The flux is much larger when all those particles are concentrated in a jet then if there’s no jet. But once the jet is formed and traveling freely into space, then unless those particles are going in **exactly** the same direction (which wouldn’t happen), or unless they are interacting with each other to keep them from spreading out (which doesn’t happen), then the flux decreases as distance squared. Check out photon effective mass. When you slow down a massless photon in a medium* it exhibits “effective” mass. Trap it in a mirror-box where its speed is effectively zero with respect to the system, and this effective mass is indeed effective – the mass of the system is increased. Open the box and it’s a radiating body that loses mass. Anyway, neutrino mass oscillation can’t be much different. Neutrinos have to be slowing down and speeding up. Not much, but they can’t be travelling at c. So the photons could catch them up, and overtake them. SN1987A was 168,000 light years away, this was 3.6 billion light years away. The IceCube searches only covered ±1 hour and ±1day. Is everybody sure that’s enough? * Sorry to be all relativity-picky, but photons etc move through space rather than spacetime. The latter is a static “all times at once” model, there’s no motion going on in it. Not always (or generally) true. There are many possible dispersion relations (relations between energy and momentum), once you are in a medium: speed, mass, and other things can all change. As for neutrino mass oscillations, you don’t really understand the math; they aren’t “slowing down and speeding up”, because quantum mechanics is more subtle than that. And as for how much slowing is involved for the neutrinos from this GRB; we know neutrino masses m are not more than 1 eV; IceCube is sensitive to neutrinos with energies E of 1011 eV or more; the fractional delay is 1/2 (m/E)^2 = 0.5 x 10-22 if the neutrinos have the largest allowed mass and the smallest allowed energy (let’s just say 10-22 to keep the math simple); the number of seconds since the GRB occurred is 3.6 billion years = 3.6*109 years x 3*107 seconds per year = about 1017 seconds; therefore the delay is about 10-5 seconds (a hundredth of a millisecond) or less. Yes, I’m sure. Even for the neutrinos from source 1, the delay is seconds or minutes. Not days. I’m sure IceCube will look for neutrinos that arrive later than expected. But this can only happen if they have very exotic properties that don’t merely have to do with their having masses. You could imagine a delay if you assign neutrinos new properties that distorts their paths somehow. But then you’d probably miss the neutrinos from this GRB anyway. Not only would they arrive late, they probably wouldn’t arrive from the expected direction, or together, assuming any got here at all. So you’d probably have no idea they were associated with this GRB. All points noted Matt. I don’t think neutrinos are exotic things with distorted paths. But I do think there really isn’t all that much hard scientific evidence to go on when it comes to neutrino speed. So I will respectfully disagree with you. IMHO we shouldn’t say “We’re sure” and then not look for scientific evidence outside our expectations. Instead we should just look, and take it as it comes. And yes, OPERA was a debacle*, but we should trawl back too. Take nothing for granted. these GRBs are your lab. * There were some speculations surrounding OPERA. I’d like to make it clear that I’m Mr Mundane personified: I think that time travel and retrocausality etc is out of the question – we don’t literally “travel forward through time” and so in no sense can anything travel back. In a paper by Longo, 1988, on the neutrinos and photons emanating from supernova1987a, (testing the EEP) he starts from the premise that both of these particles’ motions are subject to General Relativity and thus are subjected to the same distortions caused by gravitational fields as they travel through space. I realize this is not crucial to the understanding of neutrinos or lack thereof from the Apr. 27-th GBR but it is an interesting point on how photons and neutrinos from supernovae behave as they travel towards the earth so I thought I’d mention it. Yes, it could be important to account for this in some applications. Observing both the photons and the neutrinos would be an interesting test of the universality of general relativity, in this sense. If you want, you could try to say that the absence of the neutrinos might reflect something new and interesting about either neutrinos or about gravity or both. [For example, small unexpected effects due to magnetic fields; could they possibly be large enough to make a difference?] But the problem is that the models for producing neutrinos are very uncertain, and very very few were predicted to be observed in this GRB (I still don’t know if that number is 1 or 0.2 or 5), so not seeing the neutrinos probably just means we don’t understand GRBs, rather than the more exciting but less likely possibility that we don’t understand neutrinos or gravity, which are much better tested. Neutrinos affected by dark matter pull ? Thank you Matt for your reply, and for the clarity of your article. I agree that most likely the GRBs are what we don’t understand. The dark matter gravitational pull and expansion of space, instead of reducing the speed of neutrinos and photons in space , reduce only their energies ? The positive and negative pressure may have tug of war or neutralize each other. Spacetime is a mathematical model. Space is a physical reality not the time. Time is consistent as a physical reality only if “Big bang” was true. Expansion of space complicate time ? The photon and neutrino beams from above GRB, travel in straight line only if the burst occur in nearby regions of flat 3D universe. Othewise the high energy neutrions will penetrate the 3D “space”, at the bends of universe? I think cerenkov radiation occur because, the incoming neutrinos probably hit the electrons in water molecules and transfer it’s high energy to electron – thus making them travel faster than light speed c inside the water medium. So which type of particle came in is not important – what effect it makes and it’s energy is important ? Chenekov radiation occurs when a neutrino hits normal matter and is *destroyed* being converted into new particles, in the case of ICE a muon (An electron-like particle but much heavier.) It is this which has so much energy that it creates a ‘photonic boom’ (In cooling ponds at nuclear power plants some of the radiation is due to high energy beta particles.) The important thing is that the particle be charged and moving fast enough. This is why neutrinos (neutral particles) cannot themselves create photonic booms. Is that was happened as light flash in mount Sinai for Moses and as dark blue illuminative Lord Krishna for Hindus in India ? … And also what we mean brainstorm (US), brain wave (UK), Geistesblitz (German) ? Neutrinos travel a week or two plus anything upto few billion years of travel time. The neutrino oscillation may bypass different folds of the universe – reappear in straight line again, in our 3D space – in which less energy photons must travel all along the roller-coaster of spacetime curvature of 3D space? So neutrinos appear, travel faster than light speed ? If we take the phenomena that affected Krishna and Moses at face value then they are supernatural in origin. Recall that Moses was gone long enough to be thought dead, when he returned on one occasion his face emitted rays so that he had to wear a veil to hide it. At present there is no evidence for neutrinos traveling faster than light (The current observations of neutrinos arriving before photons is attributable to the fact that when they are created it takes them mere seconds to reach the surface of the star while photons can take hours or days. They leave at different times. If neutrinos do indeed somehow tunnel into other dimensions, wouldn’t there also be the chance that they would end up taking a longer route? They could travel a billion miles outside our universe but reenter it mere meters away from their starting point, surely? I mean, not the warped spacetime dimensions of Lebniz’s imaginations. Gravity as a geometric property of spacetime is, spacetime curvature – related to energy and momentum of whatever matter and radiation, are present by Einstein field equation. This curvature originated from Gottfried wilhelm Bon Leibniz(1646-1716) and his “Bucket argument” with Isaac Newton. Warped spacetime also originated here. There is coordinate transformations in which, time is relative. Immanuel Kant argued that, 3D space was a consequence of the inverse square “law of universal gravitation” or vice-versa. I mean, our 3D, flat, visible space is upto the realm of less energy photons and positive pressure’s rupture into exposing dark matter. Negative pressure is dark energy (anti gravity), so positive pressure is gravity? There is no existence of gravitation or graviton (product of QFT) in our 3D space. In this context “the straight line” – the high energy neutrinos can travel is an issue (towards earth) ? An issue with your reply is that negative pressure isn’t antigravity as such, it is not a repulsive force, the opposite of an attractive force between mass (and energy) It affects space itself and as a side effect any two objects have more and more space between them over time. This may seem like semantics. However if we take a given amount of ‘matter’ and convert it into massless particles, thus changing its pressure to be far more positive, gravitationally it’s still the same. (Another thing is that ordinary matter’s pressure increase as density increases is almost 0.) This causes problems with cyclic universe models, where each cycle ended up containing more radiation, gradually slowing the cycles. Dark matter itself has a pressure-density relationship identical (or close to) that of ordinary matter. If ordinary matter is converted into massless particles, where does it’s “angular momentum” goes? May be not in the case of dark matter – have no angular momentum -which remains as gravitional ? Spacetime curvature exists (which makes 3D space), but as tug of war between positive pressure, dark energy and angular momentum not vise-versa. – means, because of flat, 3D space, inverse square law exists ? Space is not affected where the dark matter presents. A stone(dark matter) at the place of raisin in baking cake (space expansion) analogy ? The conversion of ordinary matter to massless particles I mentioned was purely theoretical. However the best example that could conceivably happen is the ‘annihilation’ of matter and antimatter to high energy photons. In this case two particles of spin 1/2 combine to form two particles of spin 1. So I am not entirely sure how there is conservation there. All space everywhere is affected by dark energy, including the space we occupy right now. All space is also affected by gravity on account of being part of our universe where gravity has an infinite range. The only question for a given volume of space is which dominates and it seems at present, at the largest scales, our universe is dominated by dark energy. Enough so that it will not stop or even slow its rate of expansion unless something changes. Question (for extra credit): How many advanced civilizations did this GRB extinguish? Question 2: If a GRB exploded close enough, would it kill only those organisms on the side of the planet facing the it? 1.) For all we know, none, we may be the only ones out there. (Or it may have destroyed dozens.) If your question is about what volume of space would be rendered lifeless by this then it is more meaningful and I suggest you check out Phil Plait’s book Death From The Skies where this is discussed in the context of how close one would need to be to earth. It’s a surprisingly small volume of space. 2.) At close range the gamma rays from the GRB would manage to penetrate through a planet quite easily and get everyone. However this is not the primary problem. The big issue is the energy that the radiation imparts to the planet. ‘Close up’ this will simply heat the planet to incandescence, further away the atmosphere is stripped away or ionized. The GRB, like an asteroid impact, is a danger that can reach around a globe. Ehhh, is this a physics blog or a playground for sci fi scenarios? A violent event that creates a gamma-ray burst is expected to create also gravitational waves. Is there any chance to see gravitational waves from this event (or similar ones) with current detectors (or those planned for the next few years), or was the event way too far away to have created gravitational waves that are detectable on Earth? While graviational waves will be produced they suffer from numerous difficulties in detection. Firstly there is the weakness of effect. We have yet to detect gravitational waves from anything, period, so far; something that has necessitated a few rethinks over the years. The second problem is similar to that of neutrinos produced in core collapse; the waves spread out in a spherical shell decreasing in intensity with the square of radius. There is also no ay that I am aware of to create a focused beam of gravitational waves like what may happen with neutrinos. As such I should not expect any gravitational waves from anything outside our galaxy to be detectable in the near future. And in a GRB the gravitational waves *may* be beamed. But we don’t understand GRB’s well enough to know what’s really going to be detectable. I wonder if there could be a “rubber ruler” problem with LIGO. The Michelson-Morley experiment disproved the existence of the luminiferous aether, prompting Einstein’s special relativity. And yet Einstein re-introduced an aether for general relativity. See http://en.wikipedia.org/wiki/Aether_theories#General_relativity and http://arxiv.org/find/grp_physics/1/ti:+aether/0/1/0/all/0/1 . LIGO is essentially a Michelson interferometer. Maybe clock methods such as http://www.ipta4gw.org/ will “win the race to detect gravitational waves”. You might start here: http://www.ligo.caltech.edu/advLIGO/scripts/ref_des.shtml. However, this may partly involve an older view of GRBs. Clearly we don’t understand GRBs enough to make reliable predictions. Given that LIGO researchers have speculated about gravitational waves from a GRB (see http://arxiv.org/pdf/1204.4110v2.pdf), I wonder if anyone has heard anything from LIGO about their ability to constrain a GW burst coincident with GRB 130427A? I don’t think LIGO will be fully ready for this until something like 2015. To use an experiment like LIGO (its main purpose is to detect and measure gravitational waves) to detect a signal related to a GRB, it implies that we assume that all possible sources of GRBs will also produce gravitational waves, like say, a supernova (the gravitational collapse of the star that gives rise to the supernova clearly will produce gravitational waves). Is it theoretically possible that there could be some sources of GRBs that would not be associated also to gravitational waves? But the overabundance of the term speculation, speculative, etc quite picks me. Using this term in every third sentence is a bit too much in my opinion. Can theoretical ideas and arguments not just be called theoretical ideas and arguments, and not (yet?) Confirmed predictions not yet confirmed predictions? Calling everything speculation and speculative in every second sentence makes it seem completely worthless or even unmotivated and unfounded crap. And this it is clearly not! So is it not possible to talk about theoretical ideas and predictions in a more positive and fairer way? Wow, awesome blog layout! How long have you been blogging for? you make blogging look easy. The overall look of your web site is wonderful, as well as the content!. Thanks For Your article about Neutrinos From That Recent Gamma-Ray Burst? | Of Particular Significance . Wow, marvelous blog layout! How long have you been blogging for? you made blogging look easy. The overall look of your web site is excellent, let alone the content!. Thanks For Your article about Neutrinos From That Recent Gamma-Ray Burst? | Of Particular Significance . Wow, amazing blog layout! How long have you been blogging for? you make blogging look easy. The overall look of your website is wonderful, let alone the content!. 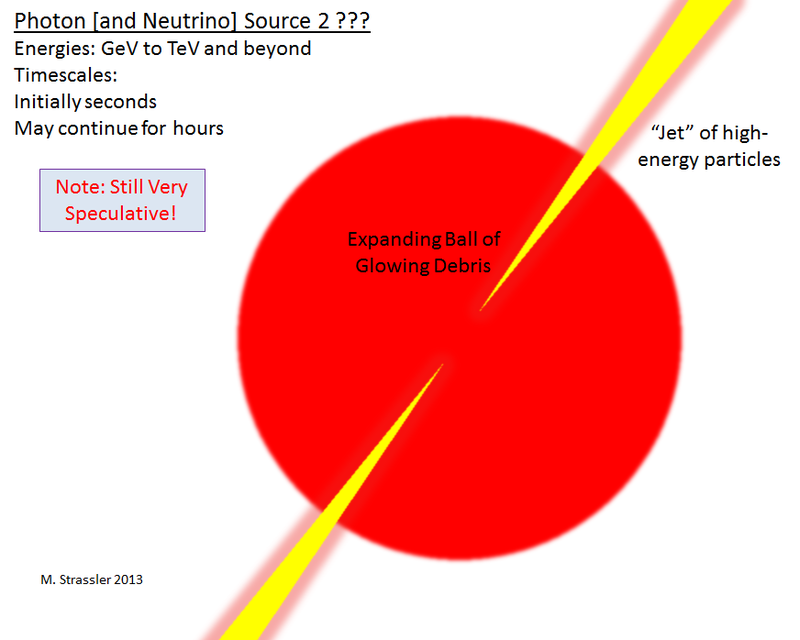 Thanks For Your article about Neutrinos From That Recent Gamma-Ray Burst? | Of Particular Significance .